Here are just a few fiestas for you to look forward to - however this list is not comprehensive ... ! 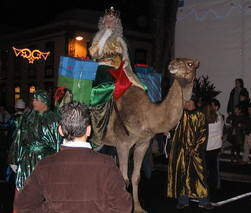 5th January - Ephinany, the Parade of the Three Wise Men celebrated in many parts of the island. This is the time of year when children receive gifts, rather than at Christmas, although these days they sometimes receive gifts as Christmas as well. Whilst there is a fiesta in many parts of the island, Santa Cruz is particularly good along with Los Sauces where the kings arrive on real camels. January or February - Los Indianos, Santa Cruz de La Palma and Los Llanos. A big and crazy fiesta which symbolizes the return of Palmerans from Venezuela and Cuba having made their riches. As white clothing symbolizes wealth, everybody wears white and to emphasise this, talcum powder is thrown freely (by the kilo) and usually over each other. It's fun! end of January/ start of February - Fiesta of the Almond Blossom, Puntagorda. Folk music, bands and dancing help to celebrate the beautiful pink blossom of the almond trees and it's also a good chance to see the traditional costume of La Palma. Additionally, there are displays of embroidery and other handicrafts along with bars and food stands. Easter - various celebrations around the island, particularly Tijarafe and San Andres y Sauces. 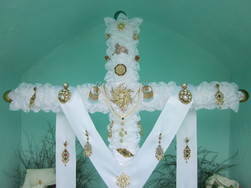 3rd May - Fiesta of the Crosses. Celebrated in Santa Cruz de La Palma, Juan Adalid (Garafia), Gallegos and Breña Alta. This celebrates the founding of Santa Cruz on 3rd May, 1493 and all crosses around the island are decorated with flowers, silk and jewellery. In Breña Alta, there is a night-time route where crowds of people walk between the crosses. June - Corpus Christi, Mazo. Every year the steep, cobbled streets of Mazo are carpeted with flowers and petals. Its origin comes from the Renaissance era and since 1873 the festival has been characterized by the creation of carpets, passageways and decorated altars of flowers. Mazo has been declared a Fiesta of National Tourist interest. Saturday before the 13th June - Fiesta de San Antonio, Garafia. One of the largest on the island attracting around 2,000 people and lasts three days. Apart from live music from a centre stage, temporary bars, stalls with Mexican cloting and fancy goods, there is a large show of cattle equine and other animals. There are variations each year with perhaps dog agailit or horse crosscountry jumping/dressage but always a timed event with oxen pulling weighted sleds around a course. July/August (every five years, 2015, 2020, etc) - La Bajada de la Virgen de las Nieves y La Danza de los Enanos. A huge fiesta lasting around 18 days and encorporating, to name but a few events, the Dancing of the Dwarves, Minuet, pilmgrimage to the throne and subsequent Bajada of the Virgen del las Nieves when the statue of the Virgin of the Snows is brought down from her church in Nieves to Santa Cruz de la Palma. It's huge. It's incredible. Don't miss it. Click here for more information. 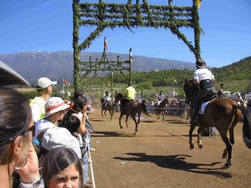 The highlight of the fiesta and what La Palma is particularly famous for (in fiesta terms) is the La Danza de Enanos. Initially appearing dressed as somber church clergy singing psalms, a dozen of the chosen few disappear into a small tent only to re-appear moments later dressed as dwarves who proceed to dance the polka. The contrast is both hilarious and amazing especially as the outfit transforming them into dwarves is entirely convincing and you will puzzle how it's done. Starts late evening and culminates in a procession through the streets at approximately 4 a.m.
August (first fortnight) - Honor a Ntra. Sra. del Rosario, Barlovento. Two weeks of events which may include a car rally, horse race, live music, fun for the kids, motor bike rally, running race, etc. Every three years there is the Battle of Lepanto involving the Moors and Christians with a fabulous mock-up of a castle and a boat (being towed across the fields). A lot of fun and a splendid service at the end of it all. 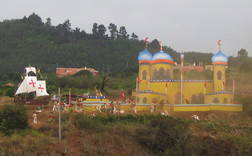 end of September - Fiesta of the Fufos, Tazacorte. People take the streets mounted on horseback, of the hobby variety. August (every three years) - Battle of Lepanto, Barlovento. An incredible re-enactment involving a castle, boats and two feuding sides, the Christians and Moors. Eventually, after explosions and hand to hand fighting, the Moors are defeated and are marched, chained and bare-foot, to the church Nuestra Señora Rosario in Barlovento where they are converted to Catholicism. Their chains are then taken off and everbody has a jolly good time. 7th September - Fiesta of the Devil, El Diablo, Tijarafe. A big night (or early morning) when, after much music and dancing, the Devil arrives in the packed main square. To excited and pseudo-terrified screams the Devil proceeds to advance on the crowds as fireworks explode from his body. As his head is 'burnt' he runs away and once more it is proved that the Madonna has defeated the devil. 7th & 8th October - the Inmaculada Concepción, Santo Domingo de Garafia. October - Ntra. Sra. del Rosario, Barlovento. 12th October - Spain Day and National Holiday in Spain and the Canary Islands. 11th November - Fiesta de San Martin. Wine cellars are opened and dinners/fiestas are organised to drink the wine while grilled chestnuts and pork fat is eaten. Christmas - various celebrations around the island and special masses. Nativity scenes are nothing short of a passion on La Palma with every town and village having an impressive display. Franceses has a life-size version with Mary, Joseph and baby Jesus in a cave along with the Three Wise Men surrounded by old farming implements.